I got the Littles down for a nap today by 12:35 for the first time in over three months. Life has meaning again. Apparently three Easter Celebrations in two days is all it takes. I'm also starting to have some "good" days, which is a welcome and much-needed change. When I say "good" days in regard to pregnancy, please don't hear me wrong. I don't feel good. I just don't feel like I'm enduring some sort of cosmic punishment in the here and now. We've almost made it to the half way point of this pregnancy. And I say "we" to credit the many family members and friends who have swooped in to rescue us from sure and pathetic implosion. Thank. Goodness. I'm a planner. And throughout this entire pregnancy, one question has perpetually been on my mind: can I possibly do this again? Most days I answer with a resounding but sad and defeated, "No." And then Spencer is his little amazing, adorable, toddler-extraordinaire self, and I think, "Gosh, but I really truly always wanted to have at least three kids...but could I possibly do this again?" And so the cycle continues. Jonathan and I both had thoughts and plans of eventually adopting. In my mind, it was something I'd do when I was an older, wiser, seasoned mother. It was something I'd do because I've heard about the need my entire life. It was something I'd do because I hope to bear witness to the fact that unborn lives are worth preserving, nurturing, and raising--whether or not I had anything to do with how they came into existence. It was something I'd do to exemplify what I believe God in Christ did for everyone who will come to him willing to be His adopted child. It really sums up the whole Story quite nicely. Adoption was not something I'd planned on doing because I was too big of a wimp to endure multiple pregnancies of my own. It was not something I'd planned on doing while I had other small children around me, the likes of whom drain you physically and emotionally every day, even on the best of days. It was not something I'd planned on doing as an "out" of some sorts in my own life. Now it's something that seems so confusing and complex. And I'm sure it shouldn't, but it still does. Many, many people, adult males included have told me of their regrets regarding the number of children they had. No one has ever told me that they regretted having so many. Fifty year old men have told me they wished they'd had more. That seemed profound to me. Perhaps only because I've viewed the child rearing and raising thing as my career. The weight with which I heard their thoughts may have been partly provided from my end as the information recipient. I heard it, and I took it to heart, because that's where my heart and my mind are. On the other hand, I've had many women, some old enough to be my grandmother, confide to me that they were unbearably sick when they were pregnant. They could only do it twice. They just could not do it again. I heard their sincerity, and with some, their peace they'd reached in this life decision they'd made decades ago. They are no less amazing women who've lived wonderful lives. My mom has told me many times that your twenties and early thirties can be a very hard, stressful time in your life. You're making decisions--personal, financial, and business-wise--that set the course for the rest of your life. I know they don't have to be "stressful," but I do think they're full of course-setting decisions. Not to mention that as you're making these decisions, you're raising your babies. And they're watching. You're teaching them what's really important, not in words or lengthy explanations, but by the priorities that become obvious with every dollar you spend, with every person with whom you cross-paths, with every hour you work. So, hopefully, no matter how many pregnancies I manage to weather, or how many years I wait to adopt, no matter how many children I raise as part of my family, I will do it well. Hopefully, the seemingly weighty decisions will fall away, usurped by the more pressing, daily decision of what am I teaching today by my decisions? The power was out. I'd bought and hidden the finger paints for just such an occasion. Spencer thought it was fun for about three minutes. 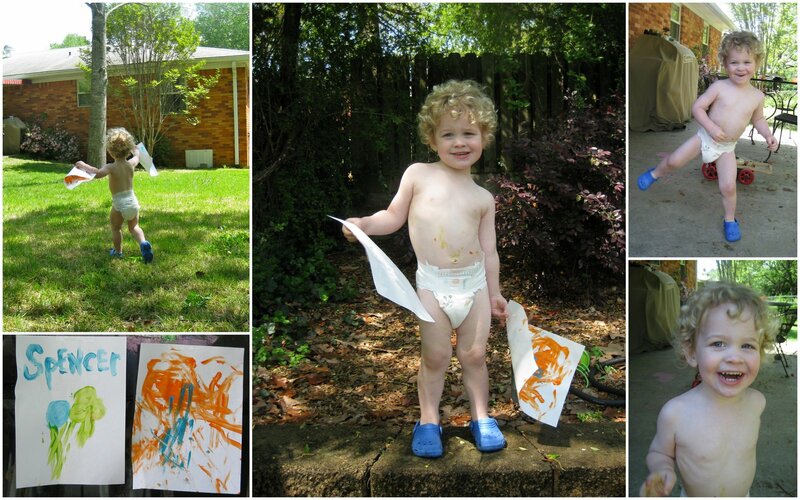 Then, he thought it was fun to make me finger paint--another three minutes. Then, he thought it was really fun to run around the back yard with the works of art, using up at least thirty minutes. There was also much intermittent dancing to my humble rendition of "Go, Diego, Go!" and "Say 'Click'!" medly-style. Spencer is a very loved boy. On any given day, a Mimi might just knock on his door. Just to play with him and to rescue him from a decent nap time. She's the one who knew of his secret, passionate desire for Dora's Backpack. She got it for him for his 2nd birthday. He plays with it almost every day. This particular visit included many-a-question pertaining to the next gift on her list for him. An Easter gift. I have to admit, she made a mean Easter basket in my days of receiving them. Lots of chocolate, jelly beans, and even some Peeps. None of the candy ever compared to the stuffed bunny that we knew we could count on EVERY year. I know my mom must have hated it, but I loved stuffed animals. I never played with dolls or Barbies, but I "collected" stuffed animals. I continued to look forward to stuffed rabbits for years and years after it was age appropriate. However, many a grand and great-grand parent have visions of Easter gifts for this little guy, so I think Mimi is going to go a different direction. I'm afraid she didn't heed my warning of not spending an arm and a leg. And as long as she doesn't reinstate her long-standing tradition of offering minor grand children a beer at every major holiday, they could have something really special. ...bless her heart, she's been waiting for over two years! Just to clarify, she has visited him many times in his 28 months, but he has never acquiesced to being held until now. What can I say? It takes him a while to warm up.